NHC has designated 90L east of the Bahamas. Visiible satellite imagery show a weak low at best east of the Bahamas. Tropical forecast models show a low spinning east of the Southeastern coast for a few days. The gradient wind may build the seas on the North and South Carolina coast for a day or two. A low has formed east of the Bahamas this morning. This system may eventually be classified as a subtropical system in the next couple of days. Forecast models take it generally northwest to about 200 miles east of the North Carolina / South Carolina border by Wednesday. After this, it is ripped apart and moved east by an upper level trough. Satellite imagery this morning show that this low is badly sheared. Deep convection is east of the low. Lows like this generally buck the models. The low is actually moving east toward the Bahamas at this time. This is not a concern for the Bahamas since there is very little weather associated with the low itself. The major impact will be gradient winds....that the wind caused by the difference between the high over the Northeast and the low east of the Bahamas. The North Carolina coast will see breezy / rainy conditions into Tuesday and Wednesday. Major cable networks are already trying to spike their ratings on this system by showing the "spaghetti tracks" which at this time add nothing. 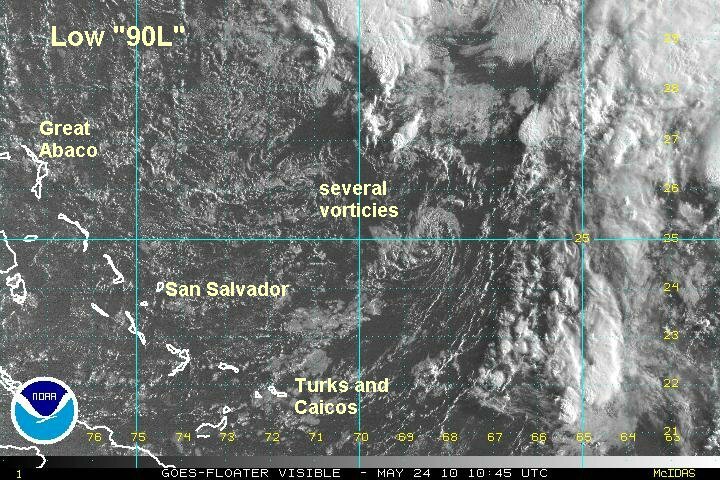 Tropicalweather.net will begin full updates with satellite imagery / radar etc. if the low shows any more organization. Forecast models continue to show some develpment of this low east of the Bahamas through Wednesday. There is a slight possibility that it could become a subtropical system. As of this time the low is forecast to stall about 200 miles east of the South Carolina / North Carolina coast then move east as an upper air trough picks it up. At the present time, the greatest impact will be some breezes and rain on the North Carolina coast. Keep in mind that weak low pressure systems like this one are many times handled poorly by forecast models. Don't explicitly buy anything that you may find in the media. As of Sunday morning the low pressure center 90L was centered about 300 miles east of San Salvador, Bahamas. Top sustained winds are estimated at only 10 mph. Wind gusts to 25-30 mph are possible east of the low under the deep convection. The low is drifting south at about 5-10 mph. The first vortex is weakening as it moves south. A new vortex has formed just to the west of the deep convection. It looks like it will follow a similar path. 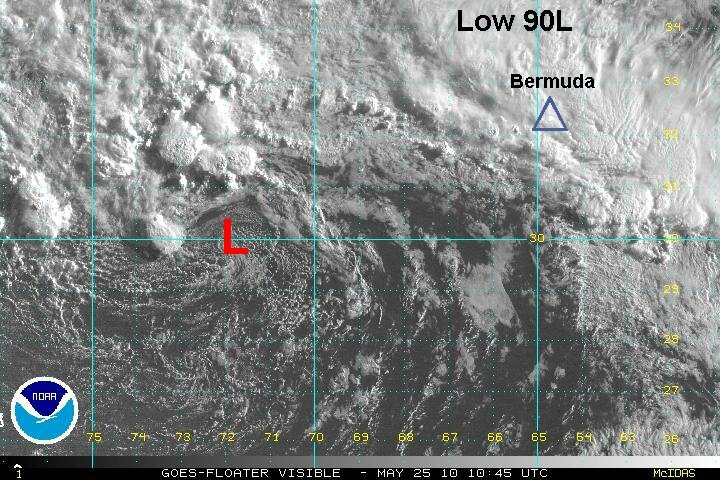 Low 90L remains disorganized. In fact the low is very broadly defined with at least three identifiable vorticies rotating within the larger low. Eventually one of these will become the main low, or possibly a new one could form. 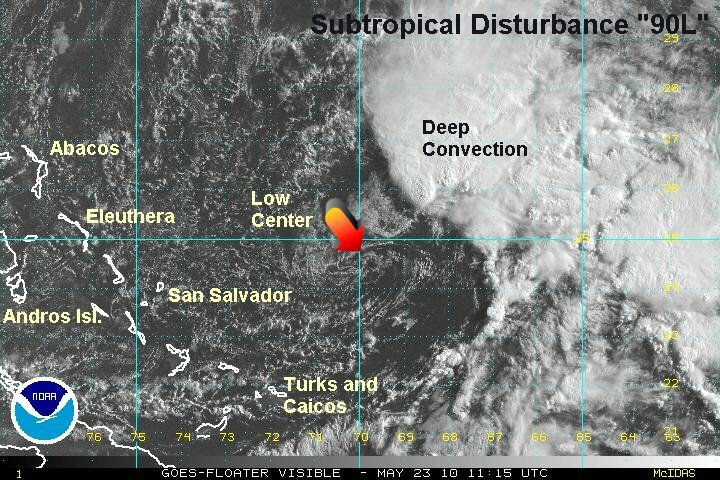 Deep convection is still well away from the low center which indicates that development will be slow. The hurricane center acknowledged the low and plans to issue a statement today around midday. They have a medium risk for it being classified. If it is classified, it would likely happen later on Tuesday or Wednesday as the models indicate a more favorable environment for some limited development into a subtropical system. As of 7am edt, the low was centered about about 375 miles northeast of San Salvador, Bahamas. Top sustained winds are estimated at 10 mph. Movement is north at about 10 mph. The latest forecast models continue to take the low northward a few hundred miles east of the North Carolina / South Carolina border by Wednesday. They diverge from there. Of the better models one stalls it and it dissipates it by late in the week. The second stalls it then takes it northward west of Bermuda and east of the U.S. east coast. The third stalls it then drifts it south off of the Florida coast as it weakens in a few days. Low pressure system 90L remains a mass of vorticies around a broad low pressure center between the Bahamas and Bermuda. There has been no further organization today. 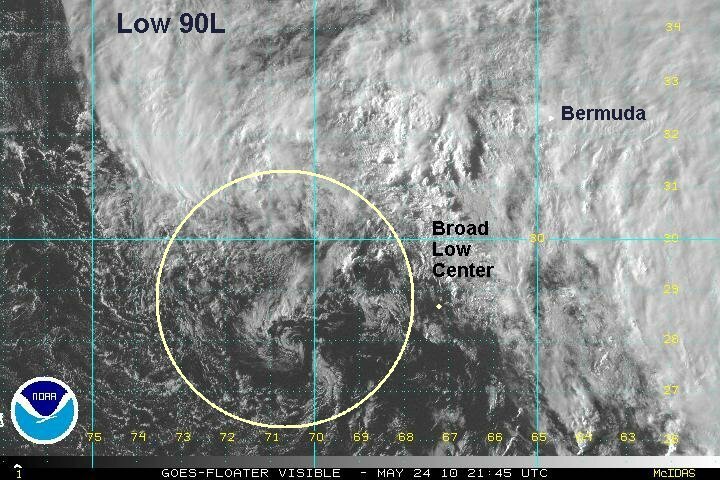 As of 6 pm edt, the low was centered about about 425 miles southwest of Bermuda. Top sustained winds - with the low are estimated at 10 mph. Gale force winds are noted well north of the low west of Bermuda. Winds are gusting to about 50 mph with 19 foot seas from a buoy. The winds are gradient winds being generated by the difference between the high and low. This gradient wind is forecast to weaken over the next couple of days. Movement is north at about 10 mph. The latest forecast models continue to take the low northward a few hundred miles east of the North Carolina / South Carolina border by Wednesday. After this a slight southward turn is forecast and the low gradually weakens off of the Southeast coast over the next 4-5 days. Low pressure system 90L is still a broad low, but has consolidated some. A definite center is now apparent, although one or two vorticies can also be picked out rotating around it. Deep convection has slowly started to develop near the low on the northside of the circulation. Bermuda now has winds at 30-35 mph. A steady light rain has been falling for most of the past 24 hours. As of 7am edt, the low was centered near 30°N / 72°W or about 460 miles west-southwest of Bermuda. Top sustained winds with the low are estimated at 15 mph. Gradient winds north of the low are from the east gusting to about 35 mph. Movement is stationary. Seas with a buoy well west of Bermuda have subsided to 12 feet. Seas over 15 feet are still possible. Tropical forecast models show the low spinning several hundred miles east of the Southeast U.S. coast over the next 4-5 days. This will generate higher than normal surf from the beachs of North Carolina south to Florida, also southwest facing beaches of Bermuda. Bands of heavy showers are also possible. As of Tuesday evening, the low pressure system has had most of the deep convection stripped away. A low level circulation is still apparent, although weak. Forecast models spin this low offshore of the Southeastern U.S. for a few days as it weakens. This will be the last update, unless intensification occurs.